Don III, also known by many as “DC,” is a fee based financial planner who also specializes in wealth management. His core belief is that a solid financial plan creates a strong foundation for a successful financial future. Using his 10+ years of experience, his primary work involves analyzing the financial picture of each of his clients through a thorough process that considers personal objectives, future goals and risk tolerance. As an investment advisor representative of Prosperity Capital Advisors, DC helps his clients by providing them with investment advice that is focused on controlling what you can control about your investment experience (fees, taxes, diversification, etc…). His goal is to help people become as efficient as possible as they strive to grow their money over time. He works with his clients in a fiduciary capacity and as a result, he is required by law to act in his clients’ best interest, which is an important distinction that sets him apart from many advisors in the financial services industry. Among all of the services that DC provides for his clients, his background in holistic planning is what really appeals the most to many of his clientele. One of the unique aspects of his holistic planning process is that he really focuses on tax efficiency with the implementation of tax reduction and tax management strategies throughout the financial planning process. On a more personal note, DC’s wife Reshma Chamberlin is the co-owner of the business strategy firm We Are January, which helps businesses to strengthen their brands by implementing a powerful digital strategy. When they aren’t working, DC and Reshma enjoy exploring different cultures by travelling the world together. "Financial Planning and Investment Advisory Services offered through C2P Capital Advisory Group D/B/A Prosperity Capital Advisors (“PCA”), an SEC Registered Investment Advisor with its principal place of business in the State of Ohio. 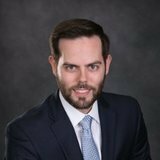 Don Chamberlin III is registered as an Investment Advisor Representative of PCA in the state(s) of Missouri. PCA and its investment advisor representatives are in compliance with current filing requirements imposed by those states in which PCA is registered and maintains clients. Registration does not imply any level of skill or training. PCA may only transact business in those states in which it is registered /notice filed, or qualifies for an exemption or exclusion from registration /notice filing requirements. This communication is limited to the dissemination of general information pertaining to its investment advisory services. Any subsequent, direct communication by Don Chamberlin III or PCA with a prospective client shall be conducted by a representative that is either registered or qualifies for an exemption or exclusion from registration in the state where the prospective client resides. For information pertaining to the registration status of PCA or Donald Chamberlin III, please contact PCA or refer to the Investment Adviser Public Disclosure web site (www.adviserinfo.sec.gov). For additional information about PCA, including fees and services, send for our disclosure brochure as set forth on Form ADV Part 2A from PCA using the contact information herein. Please read the disclosure brochure carefully."